The Panama – Mexico free trade agreement is now in effect. The pro-trade, pro-business government of Panama continues to bank on free trade. Free trade agreements with the United States and Canada have been in effect since 2012 and 2013 respectively for example. Panama imported nearly $1 billion from Mexico last year while exporting only $20 million to Mexico. The deal bodes well for Panama as 72 per cent of imported products are covered. Expect lower prices for many goods in Panama as a result. In the meantime, the agreement sets the stage for Panama’s inclusion in the Pacific Alliance which currently includes Mexico, Colombia, Peru and Chili. “The Panama-Mexico free trade agreement, which takes effect on Wednesday, will boost bilateral trade and investment, and promote regional integration, officials said. 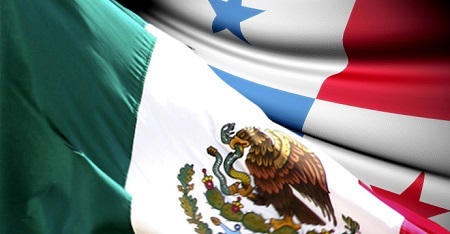 Panamanian government officials and Mexican Economy Secretariat representatives discussed the agreement at a conference held on Tuesday by the Panamanian Trade, Agriculture, Industry and Agriculture Association, or CCIAP. Participants discussed the FTA and said it provided a “window of opportunity” for merchants, industrialists and exporters in Panama and Mexico. Intellectual property, rules of origin, dispute resolution, access to markets, health regulations, e-commerce, financial services, travel rules, investment and crossborder trade were among the topics discussed. The FTA, which was signed by Panama and Mexico on April 3, 2014, has 21 chapters and covers about 4,000 tariffs. The Mexican Congress approved the trade deal on March 12, while the Panamanian National Assembly gave its approval on Oct. 8, 2014. Bilateral trade totaled $1 billion in 2014, with Mexico posting a surplus of $968.8 million, the Mexican Economy Secretariat said.